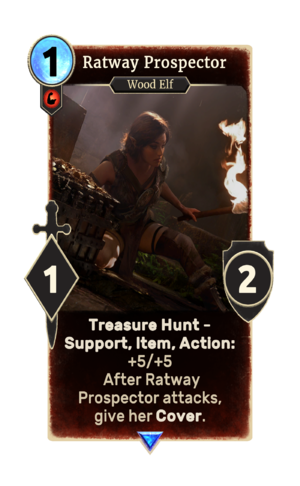 Ratway Prospector is a rare Strength creature card. It is part of the Clockwork City story set. A playset of the card is awarded for completing Thornwell Farm. The premium version can only be obtained by soul-summoning, which is only possible after the completion of Thornwell Farm. "A find like this belongs in a museum." This card's Treasure Hunt applies the Strike It Rich card effect. This page was last modified on 1 March 2019, at 23:40.